Hercules Floating Concrete builds concrete shells or floating docks according to the building calculations of professional builders. 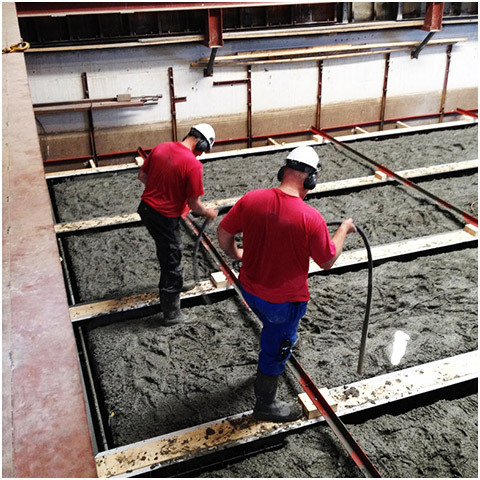 Maximum concrete strength and water tightness can be achieved by removing all air from the concrete. 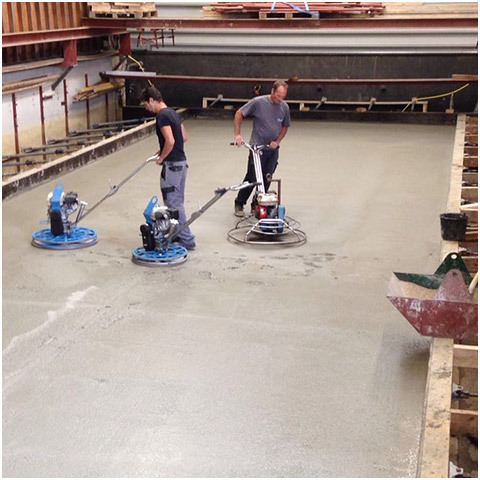 This ‘compacting’ process is carried out with great precision using steel vibrators and vibrating panels. 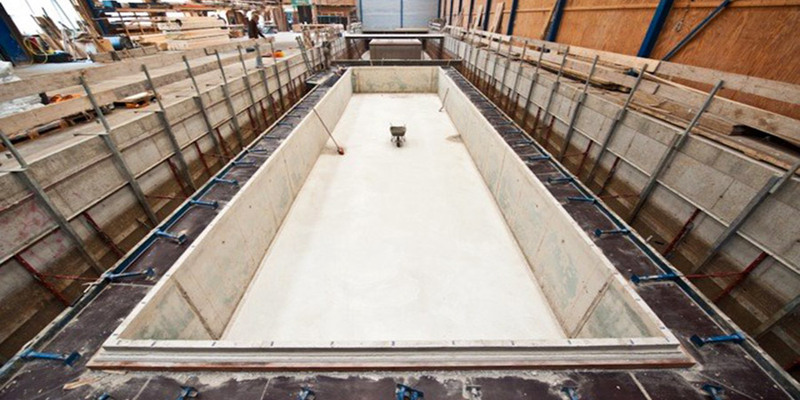 Double reinforcement with steel wire braided concrete constitutes the basis for a strong concrete shell. Hercules concrete shells are built with a minimum floor and wall thickness of 18 cm, eliminating the need for ‘ribbed rebars’, which provides the added advantage of creating a flat floor. Almost all sizes and shapes, with or without side gangway, are possible. Hercules concrete shell floor thickness and wall height can also be tailored to individual requirements so that more depth can be created, for example. The perfect finish creates an aesthetically appealing end result. 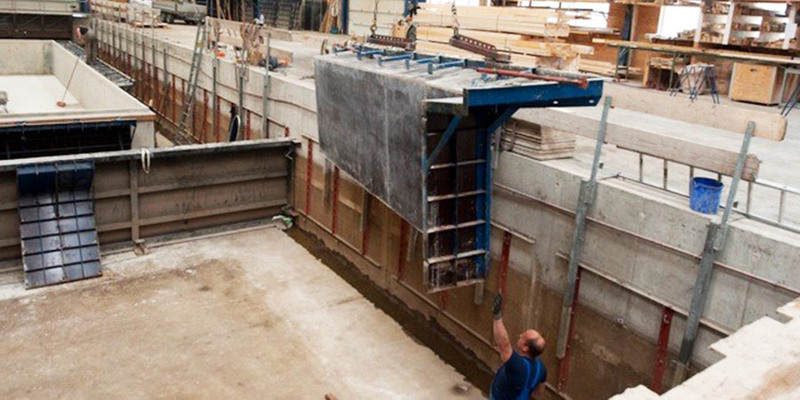 Floating Concrete builds to the highest quality standards. Quality assurance is determined by the right choice of materials, the conditioned production process and our years of experience in building concrete shells and floating docks. This quality assurance, plus our years of experience, and the craftsmanship of the shell builders guarantee perfect, high-quality concrete shells and floats. Hercules takes out an all-risk insurance policy that covers transport to final destination for concrete shells or floating docks it transports by mutual agreement. Hercules Floating Concrete, formerly known as Hercules Betoncasco, for truly experiencing the comfort of living or working on the water. Hercules has provided the following definitions for the various terms used in connection with concrete shells, houseboats, breakwaters and docks. Click the red plus sign next to the term for a brief explanation. A steel bracket secured to a houseboat and around a mooring bollard. “Sliding felt” is provided on the inside of the bracket and on the outside of the mooring bollard so that the houseboat can move vertically in a smooth (and noiseless) fashion. This ensures that the houseboat is moored firmly in place. A mooring bracket can be round or square. A houseboat can be moored in two ways: 1. By securing the houseboat to two (or three or four) steel pipe or hardwood poles. We use a steel ring, which is tied around the pole and secured to the concrete frame with a stainless steel chemical anchor. 2. With steel spacers, which create a hinged connection with the quay/shore and the concrete frame of the houseboat. How does a houseboat remain floating? According to Archimedes’ principle, which states that the buoyant force acting on an object in a fluid is equal to the weight of the fluid displaced by the object. The foundation on which a houseboat or floating house is built. It must be strong, stable and safe. It is, in fact, so strong that no dividing walls (ribs) are needed. This allows you to customise your floors to your taste. Different grades of concrete can be used. Hercules Betoncasco uses a specially formulated C32/40 grade concrete mix. A brand is a distinctive word, name, symbol or sign employed to identify a property. Where houseboats are concerned, it indicates that the houseboat is (has been) registered (in the ship registry of the land registry). According to statutory requirements in the Netherlands, the brand must be affixed by the land registry, which has a legal duty to do so within three months of registration. It must be strong, stable and waterproof. Hercules concrete shells obviously meet these requirements. It is, in fact, so strong that no ribbed rebars are needed. Thus, a Hercules concrete shell can be configured as desired (see also concrete shell). Refers to the underwater depth of a houseboat, similar to that of a boat. Needless to say, you will need to take into account the depth of the water at the mooring site and the route leading to it. 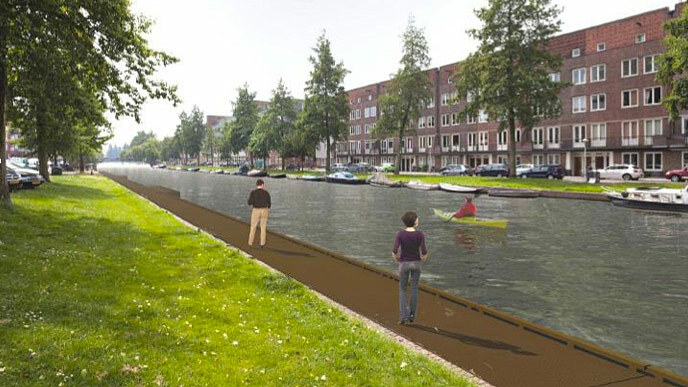 A floating terrace can be made in different ways and from different materials. For example, air or foam-filled floats or a concrete frame can be installed under the terrace. If a concrete frame is used, the terrace can also serve as a storage area. Hercules Betoncasco builds various types of floating terraces. A rock pocket sometimes occurs in older concrete shells. It is a ‘concrete fault’ of sorts, which occurs when gravel accumulates in one area as insufficiently compacted concrete is poured. This creates a weak spot in the shell and may cause premature moisture penetration. However, today’s techniques are so advanced that this does not occur anymore. The concrete shell of older houseboats may exhibit signs of cracking. This may also be due to a collision, for example. Cracking can be repaired by injecting a two-component epoxy through small hoses inserted in the crack. This will fill up the crack and restore the shell’s original strength. The land registry registers and provides information about the location of real estate in the Netherlands, including associated rights, such as property rights and mortgage. This also applies to ships, aircraft and underground networks. This legal duty ensures legal certainty: who owns what, where the boundaries are. They also provide information about energy labels and the location of cables and pipelines. The size of a houseboat is important for the issuing of permits. Most municipalities require the main dimensions of the houseboat, i.e. its width, length and height above and below the waterline. The extent to which the water level rises or falls. The ship registry is part of the land registry. Professional and recreational craft and houseboats that are under construction or completed can be registered in the ship registry. On completion of the registry, the registrar will grant a certificate of registry, where a ship is then recognised as a movable property. Registration primarily consists of filing instruments of transfer and mortgage deeds in order to identify the owner of/the person entitled to use the ship. If a houseboat is not stable, it can easily be righted. There are several systems available for doing so. Depending on the mooring site requirements, such as the allowable depth, options must be explored to determine how stability can be restored. A simple solution, such as installing air-filled floats under the shell, is often possible. Reinforcement is used to strengthen concrete structures, which is referred to as reinforced concrete. Steel rods, cables or nets are by and large used as reinforcement. Reinforcement is installed just below the concrete exterior (the cover) to prevent damage. The cover is stipulated in standards and depends on the intended use of the structure. Stability is the extent to which a houseboat or other floating structure maintains a straight and balanced position. It must and may not capsize, of course. Archimedes’ principle, stated in 250 BC, marked an important first step towards the theory of stability. Standpipes can still be found in some older houseboats. They used to be installed in the bottom of the shell for drainage of toilet tanks into the water, which was allowed at the time. The structure involved making a hole in the shell with a pipe around it to make it waterproof. Nowadays, houseboats are connected to the onshore sewer system, rendering the use of standpipes as good as non-existent. Professional and recreational craft and houseboats that are under construction or completed can be registered in the ship registry. On completion of the registry, the registrar will grant a certificate of registry, where a houseboat or ship is then recognised as a movable property. Registration primarily consists of filing instruments of transfer and mortgage deeds in order to identify the owner of/the person entitled to use the houseboat or ship. The weight of a houseboat is specified in tonnes. One tonne is equal to 1000 kilograms. The weight can be determined by calculating the water displacement of the house: 1 m3 water = 1 tonne = 1000 kg. The houseboat or floating house is usually transported by water. There are several companies that specialise in this. It pays to request several quotes at a time. Hercules Betoncasco can take care of this for you. Trimming is defined as setting the houseboat straight. Replacement of an old houseboat requires a ‘replacement permit’. This permit describes conditions such as length, width and height, fire safety rules, etc. These conditions vary by municipality or borough, from which you can also apply for the permit. It may take a while before you receive it. Submit a request as soon as possible. If you want time to move and moor your old houseboat next to your new one, you will need a permit for ‘double’ mooring. Hercules Betoncasco would be happy to assist you in obtaining a (replacement) permit. The conditions are usually set out in a houseboat memorandum of the municipality. 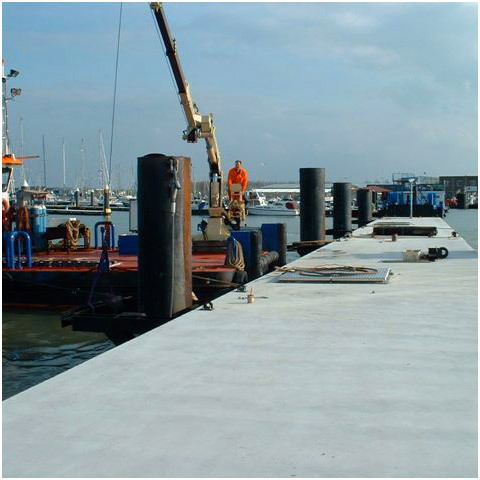 The right choice of material and our years of experience guarantee high quality concrete shells and/or floating docks.